Fall and winter are the special seasons that brings on the holidays, work parties, family gatherings and such. The holiday also give the chance to utilize those beautiful rich deep colors. We did some hard searching and compiled a list of the only lipstick staples you need to be ready for the seasons so you can enjoy these times with a little less stress. Enjoy! it’s no surprise that a true red is a must have during this time of year. A flattering red whitens the teeth and is perfect for photos for events and in front of the christmas tree. Burgundy lips are the epitome of elegance as long as you stay in the right shade range. Too dark and you risk looking goth, we love Mac’s Diva which is universally flattering and Burberry’s Oxblood. BOTH have a cult following behind them. Muted nudes are better suited for the gals that love their nudes but want to stay in season. Dior’s lipstick in Stunning is the perfect shade for the season which is why it’s limited edition and the packaging is something marvelous. You’ll feel so luxurious pulling your lipstick out, grab one before they disappear! A rich magenta shade is a beauty during this season. A great way to bring color back to the face when wearing the dark toned outfits. 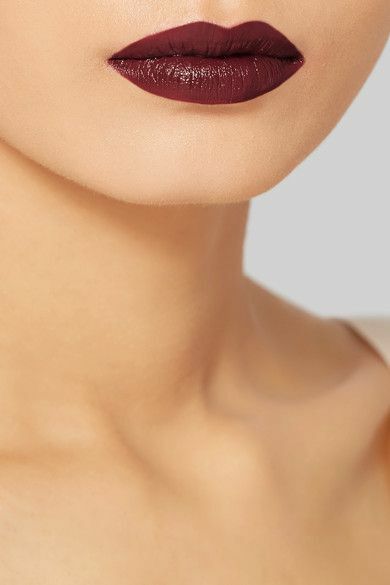 We love pairing an all black ensemble with gold earrings and these plum lip shades.